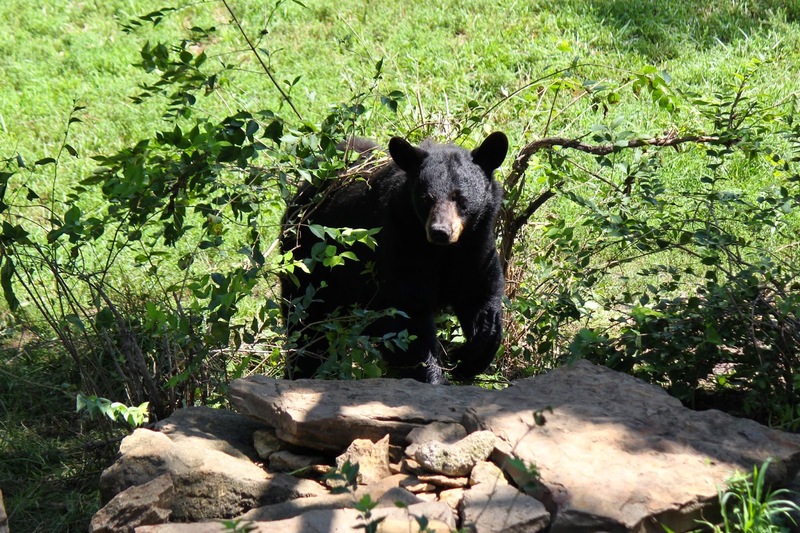 Janie's Pocono Mountain Garden: There's A Bear In My Yard! There's A Bear In My Yard! Got your attention, didn't I? Well, it's a pretty common sight here in the Poconos, especially in the Fall. Black bears are looking to fatten up before Winter sets in. They can actively feed up to 20 hours a day and consume more than 20,000 calories. They are omnivorous. They do eat meat, but roughly 85% of a black bear's diet comes from plants. They love berries, acorns, and honey. They especially love beehives, and will even eat the bees! Unfortunately, they will also eat garbage. In my neighborhood, it's not uncommon to see strewn garbage laying beside overturned trash cans on garbage pick-up day. We quickly learned to store store our trash cans in the garage and take them out to the street only on the morning of trash pick-up. 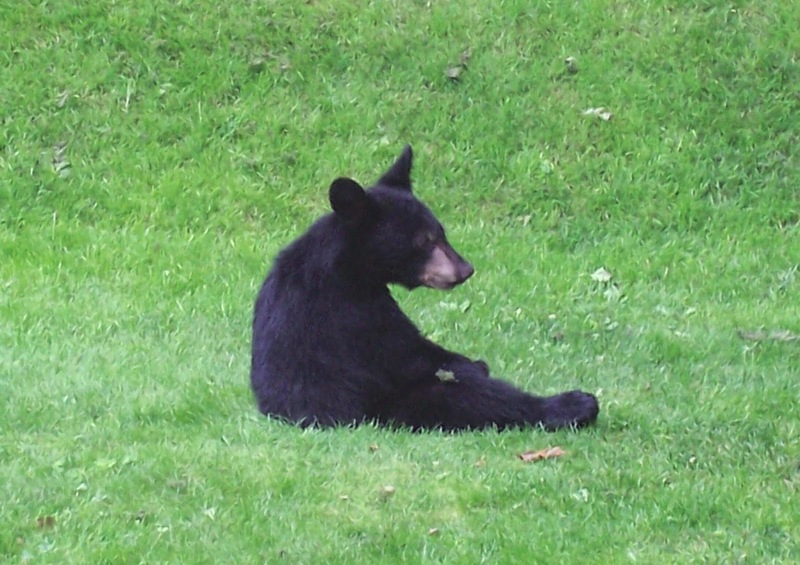 By nature, black bears are shy creatures and they generally avoid people. They have poor eyesight, but have excellent hearing and sense of smell. On average, they weigh between 125 and 600 pounds. 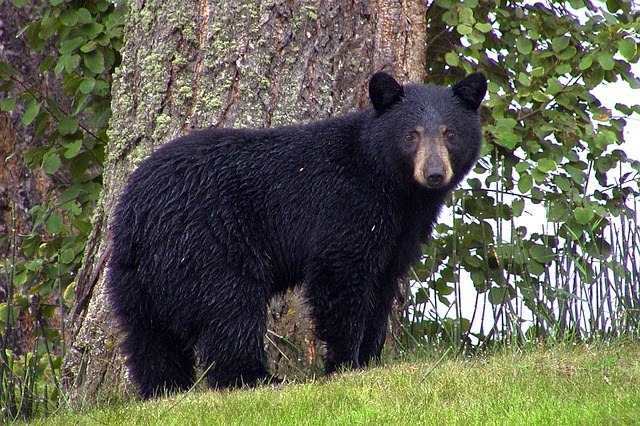 Black bears become dormant during the winter months and look for resting places usually in rock crevices, under fallen trees, thick brush, or inside excavated holes under shrubbery. Their breathing and heart rate slows, and their body temperature also drops slightly. They neither eat nor drink during their winter sleep. On occasion, on a warm winter day they may stir and venture off a bit to look for food. Mating season usually takes place in June through July, and then the mated pair go their separate ways. Female black bears usually give birth to 2-3 cubs during the months of January and February. The cubs are still quite young, usually between 2 and 3 months old, when they they eventually leave the den with their mother sometime in the early Spring. The female will singularly raise her young. They will continue to stay with her for a little over a year before they will be ready to completely venture out into the world on their own. So, now that I've told you a bit about our bears, I guess you wonder if I fear them? No, not at all. Bear attacks on humans are extremely rare. A human has more of a chance of being chased by a swarm of angry bees or being struck by lightning than being attacked by a bear. Sharing our mountains with black bears is not really all that difficult. Just use common sense. Be cautious and aware, but also be respectful. In return, every time you happen to glimpse one of these beautiful animals walking through your yard, the sight of it will instill in you a sense of awe that is absolutely indescribable!